Published: Aug. 25, 2018 at 08:14 p.m.
Baltimore Ravens quarterback Robert Griffin III shows his versatility on 21-yard keeper. Published: Aug. 25, 2018 at 07:45 p.m.
Baltimore Ravens quarterback Robert Griffin III takes off for 20-yard QB scramble. Published: Aug. 9, 2018 at 10:47 p.m. 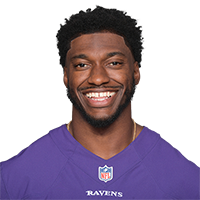 Published: Aug. 23, 2014 at 10:36 p.m.
Washington Redskins quarterback Robert Griffin III's pass is tipped in traffic and intercepted by Baltimore Ravens linebacker C.J. Mosley.